In the first episode of American Horror Story’s fifth and current season, it takes less than one minute and thirty seconds for us to get a good look at the inside of the fictional Hotel Cortez, and after four episodes like that fabled lodging in the Eagles song we’ve been allowed to check out a few times, but never really leave. That’s okay though, because this set is absolutely beautiful. In a - stuck in time because it’s haunted by serial killer ghosts and vampires - kind of way. The lobby of the fictional American Horror Story’s Hotel Cortez, in Los Angeles, CA. We have to say, the result, is pretty striking. “I was really worried that he wouldn’t be able to do it, or that it wouldn’t look uniform, this thing is like 75 feet long and 20 feet wide – but he cut it together with time to spare, and then made the hallway runners, no problem at all.” A detail that’s often overlooked, even if your job doesn’t require a three week delivery timeframe – or need to look like it’s the premiere set piece for a multi-million dollar TV show – be sure you hire a good installer. Bonus tip: When using STARK, we will actually provide you with the best in the area or even fly one to your job, and we also guarantee the installation. Where the set was concerned, American Horror Story Co-Creator Ryan Murphy wanted those scary feelings to come from jewel tones and geometrics. In contrast to the color palate in most horror movies which tends to shy away from ruby reds (except for the blood of course) this season of AHS is overflowing with it, and as for geometrics: “Ryan kept saying that he wanted it to look like the carpet from the Shining.” Mission accomplished. 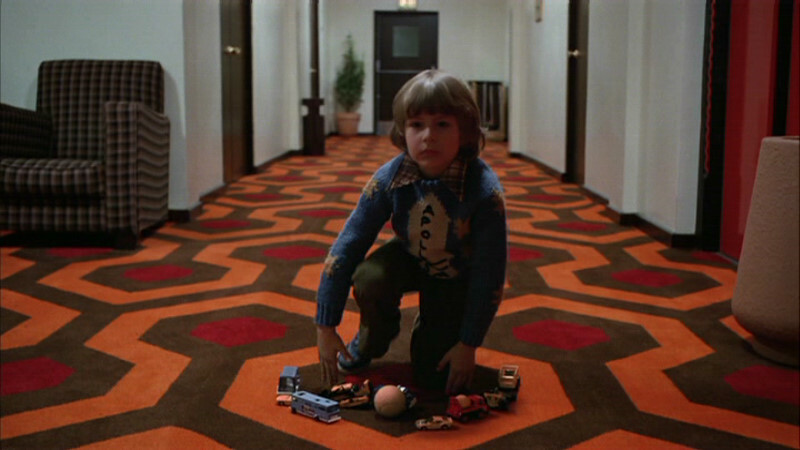 Shades of our “Hexagram” carpet in this shot from Stanley Kubrick’s The Shining. While there are many easy parallels (and at least a half-dozen AHS homages to date) between The Overlook Hotel and the Hotel Cortez; the visual similarities mostly end at the carpet. “Mark Worthington the Production Designer decided we’d go with Art Deco, so from there we had to figure out what style of art deco: more geometric, more nouveau, was it going to have a clean, understated look or be flashier like the Chrysler Building or the Empire State Building.” Leaning more toward the latter, Ellen found herself faced with one of the biggest decoration challenges of this season – the scale of this set. “It’s an absolutely massive space. Everyone involved with this show is really in favor of clean, sparse design but with a set this massive, we had to fill it with a lot of ornamental furniture, and I had to find things that were big enough to fit the space.” If one were to ever be faced with the horror of needing to find three giant gilt chandeliers then have them delivered, installed and working in about a week, we would suggest you call Ellen. “The carpet in the hallways was another challenge.” Said Ms. Brill. “There was an idea at a certain point that the hotel had been re-modeled in the 70’s and so it was going to have some of those greens and oranges and a tighter geometric pattern in the carpet –even more like The Shining– but later we scrapped the 70’s idea, and we decided it should stay true to the Art Deco feel with the larger geometric patterns.” While this thought was probably the right one, because 70’s décor is scary in a completely different way, it was also somewhat unfortunate because of the time constraints it presented. “I had to buy stocked goods and just have them dyed using a pattern that was created by one of our graphic designers. The problem with that, is during the normal wear and tear of film production the dye faded considerably. Which is ok if you’re shooting a scene set in 2015 where the carpet should look like it’s from the 1920’s. But it’s not so great when you’re shooting a scene that’s set in the 1920’s and the carpet is supposed to look new.” For AHS fans who have seen the show, this little detail is cleverly masked as is the general condition of the set parts meant to look more dilapidated, by using numerous black & white sequences during the flashbacks. In finale, Happy Halloween to all of the American Horror Story fans out there and a big thank you to the wonderful Ellen J. Brill for her work in entertaining us - she's been nominated for seven Emmys - and for taking a moment to talk to us about the tricks (and treats) of the trade. Looking for a geometric that’s a little less, bloody…?